Traditional Japanese cuisine is one of the healthiest. The diet is rich in cancer-fighting fruits and vegetables, including bok choy and shitake mushrooms. (Health.com) -- It's dinnertime, and you're craving something with a little flavor. Maybe you'll grab Indian takeout or whip up a taco salad. But, uh-oh, these days it's easy to find yourself biting into the ethnic version of a triple burger and fries. You don't have to live on the West Coast to reap the body benefits of the California style of cooking. California Fresh is all about enjoying seasonal, local foods that are simply prepared -- and that's a healthy style you can adopt no matter where you live, says supermarket guru Phil Lempert, a leading consumer trend-watcher. Eating plenty of disease-fighting, naturally low-cal, nutrient-rich fruits and vegetables from a local farmers' market or farm is good for your body, and it's satisfying, says Frances Largeman-Roth, R.D., Health magazine's senior food and nutrition editor. "Foods grown locally are going to taste better and may have more nutrients," she explains, while produce that's shipped cross-country after being harvested can lose vitamin C and folate, not to mention flavor. And what should you whip up from your local riches? Chef Annie Somerville at Greens Restaurant in San Francisco serves orrechiette with mushrooms, broccoli rabe, Italian parsley, hot pepper, olive oil, and Parmesan cheese, or grilled veggie skewers over quinoa or couscous. Danger zone: Relying on high-fat cheese to flavor veggie-based dishes is not a waist-friendly move, Largeman-Roth warns. Fresh herbs, lots of vegetables and seafood, and cooking techniques that use water or broth instead of oils -- these are some of the standout qualities of Vietnamese food. "This cuisine, prepared the traditional way, relies less on frying and heavy coconut-based sauces for flavor and more on herbs, which makes it lower in calories," Largeman-Roth explains. One of the healthiest and most delicious Vietnamese dishes is pho (pronounced "fuh"), an aromatic, broth-based noodle soup full of antioxidant-packed spices. Danger zone: If you're watching your weight, avoid the fatty short ribs on many Vietnamese menus. When Miller was traveling around the world doing research for her book, she found that traditional Japanese cuisine -- especially the version eaten on the island of Okinawa, where people often live to 100-plus -- was superhealthy. "Not only are Okinawans blessed with a diet rich in cancer-fighting fruits and vegetables, but they also prepare them in the healthiest way possible, with a light steam or a quick stir-fry," Miller explains. They also practice Hara Hachi Bu, which means "eat until you are eight parts (or 80 percent) full," she says. These simple diet rules may be why people in Japan are far less likely than Americans to get breast or colon cancer. Japanese staples that are amazing for your health include antioxidant-rich yams and green tea; cruciferous, calcium-rich veggies like bok choy; iodine-rich seaweed (good for your thyroid); omega-3-rich seafood; shiitake mushrooms (a source of iron, potassium, zinc, copper, and folate); and whole-soy foods. "The soy that's good for you is unprocessed, not made into fake meat," Miller says. Think: tofu, edamame, miso, and tempeh, a nutty tasting soybean cake made from fermented soybeans. Healthy choices the next time you visit a Japanese restaurant? 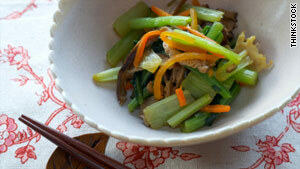 Miso soup, which typically contains seaweed and tofu, or a simple veggie-and-tofu stir-fry. Danger zone: White rice can cause a spike in blood sugar, so ask for brown rice, rich in fat-burning resistant starch (RS). Say "Indian food," and you probably think of its aromatic spices, such as turmeric, ginger, red chilies, and garam masala (a mixture of cumin, cardamom, black pepper, cinnamon, coriander, and other spices). These distinctive flavors do more than perk up your favorite curry: They may actually protect against some cancers. And turmeric and ginger help fight Alzheimer's, according to recent studies. Researchers point to the fact that rates of Alzheimer's in India are four times lower than in America, perhaps because people there typically eat 100 to 200 milligrams of curry everyday. Turmeric, a main ingredient in curry, may have anti-inflammatory and healing properties; its benefits are now being studied at the University of California at Los Angeles. Other good-news ingredients in Indian cuisine include yogurt and lentils, a fiber-and-RS all-star that has significant amounts of folate and magnesium, and may help stabilize blood sugar. Lentils are often combined with Indian spices to make dal, usually served as a side dish. "A vegetable curry with dal is a great choice at an Indian restaurant," Largeman-Roth says. Danger zone: Avoid anything fried, like samosas (pastry puffs) as well as heavy curries made with lots of cream and butter. The Italian tradition of enjoying a leisurely meal is good for digestion. But what really makes this cuisine a winner is its star ingredients: tomatoes, olive oil, garlic, oregano, parsley, and basil. "Studies have shown that the lycopene in tomatoes may help protect women from breast cancer," Miller says. One of the best ways to get cancer-fighting lycopene is in cooked tomato products: a half-cup of tomato sauce has more than 20 milligrams. Plus, garlic and traditional Italian herbs provide vitamins A and C. And olive oil helps lower cholesterol, fight heart disease, and burn belly fat. Notice that melted cheese isn't on that list of power Italian staples: Italians typically use Parmesan or another hard cheese instead, grated in small amounts for a big flavor boost. Danger zone: Americanized dishes like double-cheese pizza or gooey lasagna tend to be loaded with fat and calories, Largeman-Roth says. Our judges applaud the Spanish tradition of eating tapas (small plates of food): "I love the idea of being able to sample little portions of tasty, healthful foods and making a dinner of it," Largeman-Roth says. The Spanish eat tons of fresh seafood, vegetables, and olive oil -- all rock stars when it comes to your weight and well-being. Superhealthy dishes to order: gazpacho (full of cancer-fighting lycopene and antioxidants) and paella (rich in fresh seafood, rice, and veggies). Danger zone: Avoid fatty sausages and fried items, which can show up on tapas menus in the United States. Forget those high-fat, calorie-stuffed options at many popular Mexican restaurants: Authentic Mexican cuisine can be heart-healthy and even slimming, our judges say. In fact, a Mexican diet of beans, soups, and tomato-based sauces helped lower women's risk of breast cancer, a study from the University of Utah found. And the cuisine's emphasis on slowly digested foods like beans and fresh ground corn may provide protection from type 2 diabetes. "Slow-release carbohydrates have been shown to lower blood sugar and even help reverse diabetes," Miller says. Danger zone: It can be easy to overeat rich queso dip; keep fat and calories in check by portioning a little out of the dip bowl. With 12 countries within its borders, South America has a very diverse culinary repertoire. But our judges applaud the continent's traditional diet of fresh fruits and vegetables (including legumes) along with high-protein grains like quinoa. In fact, a typical South American meal of rice and beans creates a perfect protein, Largeman-Roth says. While some parts of South America are famous for their huge steaks, a healthier option (unless you share the steak with friends) is ceviche. This mélange of fresh seafood boasts a variety of healthful spices and ingredients, from cilantro and chile peppers to tomatoes and onions. Danger zone: Brazilian or Argentine restaurants often have fried items like sausage, yams, and bananas. If you're trying to lose pounds, steer clear or split an order with the table. Can a soup fight cancer? If it's a Thai favorite called Tom Yung Gung, the answer just might be yes. Made with shrimp, coriander, lemongrass, ginger, and other herbs and spices used in Thai cooking, the soup was found to possess properties 100 times more effective than other antioxidants in inhibiting cancerous-tumor growth. Researchers at Thailand's Kasetsart University and Japan's Kyoto and Kinki Universities became interested in the soup's immune-boosting qualities after noticing that the incidence of digestive tract and other cancers was lower in Thailand than in other countries. Many common Thai spices have feel-great benefits, our judges point out. Ginger aids in digestion, turmeric is an anti-inflammatory, and lemongrass has long been used in Asian medicine to help treat colds and ease tummy troubles. Danger zone: When you're eating out, avoid soups with coconut milk because they're high in saturated fat (and calories).